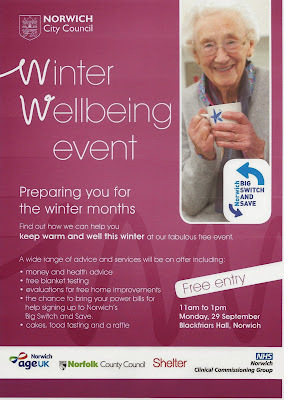 On Monday 29 September Norwich City Council, in partnership with a number of other organisations, is holding an event at Blackfriars Hall, Norwich which aims to make winter warmer for Norwich residents. Members of the public are invited to come along to take a look at what Norwich can offer to keep you warm this winter. There will be a wide range of advice and services on offer including seasonal wellbeing checks, details on free home improvements and free electric blanket testing.